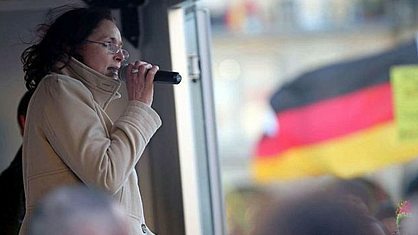 With thanks to Gates of Vienna, here is the text of The Prague Declaration, as read by PEGIDA leader Tatjana Festerling at yesterday’s rally in Dresden. Women such as she are leading the fight to save Europe. We shall not surrender Europe to our enemies. We are prepared to stand and oppose political Islam, extreme Islamic regimes and their European collaborators. We are prepared to risk our freedom, our property, our occupations and careers and perhaps also our lives as generations have done before us. It is our obligation to future generations. We refuse to submit to a European central government. The regulations of the global elites have brought us poverty, unemployment, corruption, chaos and moral collapse. It is time this came to an end. We respect the sovereignty of European nations and the rights of people in all European countries to govern their affaires as they see fit. We hold it to be a sacred right of the citizens of all European countries to protect their borders and to decide which migrants they accept and which they do not accept into their countries. We call attention to our common European roots, traditions and values, as well as to the historical alliances of our nations. We are resolved to protect Europe, freedom of speech and all other civil liberties, as well as our common way of life together. We shall manifest this resolve by our participation in a joint demonstration, which will take place on 6 February 2016 in many European countries. This entry was posted in Islam, Islamization, Jihad and tagged Islam, Jihad, PEGIDA, Tatjana Festerling, The Prague Declaration. Bookmark the permalink.